The Angsana Spa at the Vineyard Hotel & Spa in Newlands is situated alongside the banks of the Liesbeeck River at the bottom of the hotel’s beautiful manicured gardens. Privacy and tranquility allow you to shed the cares of the world while your body and mind are pampered with invigorating treatments. For couples, the ultra-romantic double treatment room features a spa bath big enough for two and a private garden patio. With a range of massages (Thai, Swedish, Hawaain, Ayurvedic, to name but a few), scrubs, facials, manicures and pedicures, gorgeous indoor and outdoor swimming pools, a Steam Room and Rainmist Therapy Room, the Angsana Spa is pamper perfect. The surroundings are therapy in themselves, but the spa is the focus of the abundant natural healing energy you’ll experience at Bushmans Kloof. It’s a peaceful sanctuary where you’ll surrender to the ancient mystical powers of the African landscape. The spa consists of 4 treatment rooms (2 dual and 2 single) and a Crystal Steam Room (ideal for body wraps and scrubs or mud treatments), all located to embrace the natural beauty of the reserve. Soothing, pampering treatments are complemented by an exceptional range and choice from Elemis and Dermalogica, as well as local products. For an outdoor spa experience, the Riverside Gazebo (one of the dual treatment rooms) offers panoramic views and tranquil waters. Sanctuary Spa in Camps Bay is a magical oasis of tranquillity cut into the surrounding rocks. 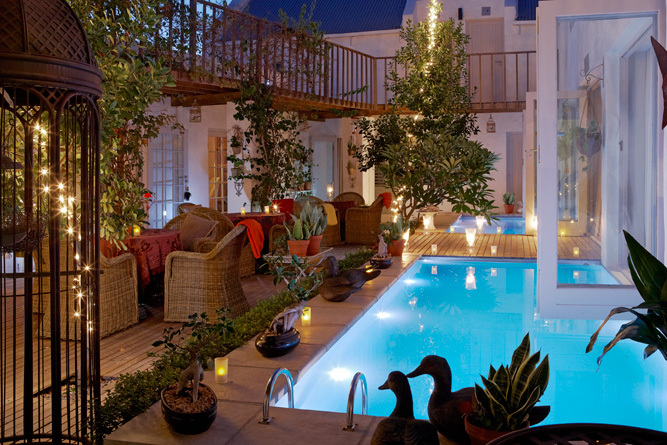 Inside you’ll find hot and cold plunge pools, Cape Town’s only Rasul chamber, a sauna and a hydrotherapy bath. Seven treatment rooms in which you’ll be pampered with a range of treatments utilising indigenous fynbos flora or the Elemis International Spa Range. For something different, try a secluded open-air treatment in a shady gazebo overlooking the vast Atlantic Ocean … could anything be more rejuvenating? At Tswalu Kalahari Spa the objective is to create rebirth from within… by applying an intimate knowledge of nature, plants and the powerful gift of touch. Therapies are performed by an internationally qualified therapist, and are individualised to exceed your expectations. The Gorge Spa’s three treatment rooms each feature a large window providing a spectacular view of the majestic cliffs of Oribi Gorge. One is a double room, giving couples the opportunity to enjoy a relaxing massage or revitalising body wrap in each others company. Allow nature to replenish body and soul. Our unique treatments, performed by experienced therapists, incorporate the acclaimed Dermalogica brand, as well as the eco-friendly Africology body therapy range. Treat yourself to some hand or foot therapy whilst soaking up the sun on a private deck, or lounging next to the Jacuzzi. The hotel’s spa is tucked away amidst cascading gardens of the Westcliff’s hillside village with the soothing sounds of birdsong and gently tinkling fountains lies the Westcliff’s Botanica Spa Suites which is an oasis of indulgence, pleasure, relaxation and radiant transformation in Johannesburg. Tucked away amidst The Westcliff’s cascading gardens and delightful fountains, lie the Botanica Spa Suites, an inviting oasis of indulgence and relaxation. Three beautifully spacious hotel suites have been converted into calming treatment rooms with en-suite bathrooms and changing areas, where skincare specialists offer an all-encompassing selection of facial and body treatments, using the elite range of Pevonia Botanica products. The award-winning Chicama Country Spa at Glenburn Lodge in Muldersdrift located in the heart of the Cradle of Humankind, is located in tranquil, scenic and calming surroundings with spectacular views from every angle. The spa offers a total of ten treatment rooms including 4 couples therapy rooms, a heated indoor swiming pool, Rasul chamber and steam room. The spa menu features day and overnight packages, individual pampering and wellness treatments, bridal packages, hen parties and romantic getaways. The Aroma Boma Spas at Ulusaba’s Rock and Safari Lodges are the perfect antidote to all the excitement of game drives. A whole range of treatments is available, from facials and massages through to those essential grooming rituals. The Aroma Boma at Rock Lodge is located 800 feet above the African Savannah with truly stunning views over the Bush and offers complete privacy. At Safari Lodge, The Aroma Boma is built on the banks of the dry Mabrak riverbed amongst the trees and away from the main lodge area, so the only likely disturbance is perhaps the odd elephant wandering past! The spectacular spa is sure to create magical moments and turn them into special memories. Relax, unwind and take yourself on a pampering escape you’ll never forget. A truly African experience, the Amani Spa at Shepherd’s Tree Game Lodge is the ultimate escape for pure self-indulgence. A banquet for the soul and senses using our unique Spa product brand, Africology, made from the purest of ingredients, free from artificial preservatives, colouring and fragrances. Relax in the lap of luxury and enjoy our pampering Holistic Body, Skin and Beauty Rituals designed to revitalise and restore balance and harmony to your body, mind and soul. You are guaranteed to walk out glowing from the inside out! Which one has a hair spa service? I want to treat my mother to a spa where she can avail this service.